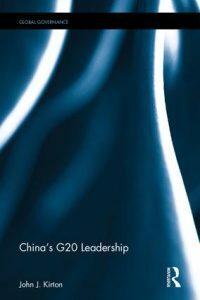 Kirton offers a comprehensive, systematic examination of China’s G20 approach, diplomacy and influence since the G20’s start as a forum for finance ministers and central bankers in 1999. This comprehensive reference tool works its way through China’s elevation to the leaders’ level with summits from 2008-2014, to the prospects for its Antalya Summit in November 2014 and above all China’s first summit as host in Hangzhou in the autumn of 2016. This book contains a full treatment of China’s role in the summits from 2011 to 2014, and China’s plans, role and prospects for the summits in 2015 and 2016. Analytically, it develops and tests at the level of a single member country the systemic hub model of G20 governance that was developed for and guided in Kirton’s 2013 book, G20 Governance for a Globalized World.